Hot off the assembly line is the brand-new, Super Treasure Hunt ’69 Dodge Charger Daytona from the 2016 Muscle Mania Series. This hot ride is first starting to show up at retail however that hasn’t stopped Malaysian online sellers from distributing these for a premium. Its unclear as to how they are obtaining these cars but collectors have speculated that factory workers have been pulling them off the assembly line and reselling them at local Malaysian markets or selling them in batches to online sellers in the United States. I obtained the car you see below from an online seller here in the United States, who most likely obtained the batch of these that he had for sale, from a Malaysian contact. He always has loose versions of Super Treasure Hunts before they hit stateside. I typically do not buy from sellers when I perceive them to be involved in these shenanigans, however, between the low price and a case of the gotta-have-it-nows, I elected to buy this car with the chance that this may have been obtained in a less-than-moral manner. Sure, you say that I am just contributing to the problem and I couldn’t agree more. It just goes to show that some of the more established, level-headed collectors such as myself, fall victim to the latest and greatest. As for the car itself? Well, looking at it you can see why I impatiently bought it. The spectraflame green paint sits over that ZAMAC body so smooth that you almost feel the need to wax it! The simple black graphics with small “TH” logo behind the front fenders are a nice touch. To finish it off, the Real Rider 5-Spoke (RR5SP) Wheels make this casting pop! I can’t wait to get my hands on the regular variation of this release so I get see them side-by-side (I will upload the pic here when I do so). 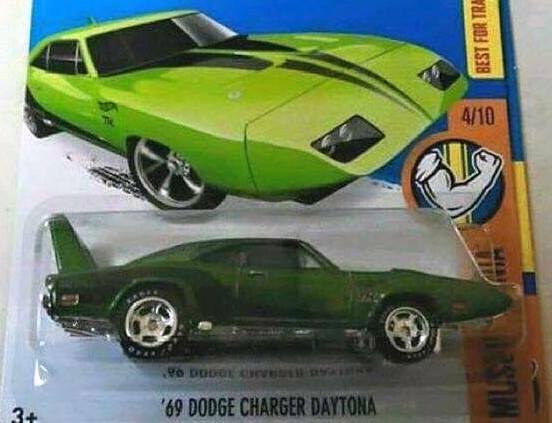 The Hot Wheels ’69 Dodge Charger Daytona casting was introduced in 2013 after its predecessor, the ’70 Dodge Charger Daytona (debuted in the 1996 First Editions), was final run’d in 2003. It looks very similar to the #’70 Plymouth Superbird casting but when place side-by-side, the differences are noticeable. Early “assembly line” photos of the Super TH you see below, had Slotted Real Riders w/ Goodyear tampo on them, but those have proven to be nothing more than what collectors now deem as a “factory custom” done by Malaysian profiteers. RELEASE DETAILS: Spectraflame Green Body (metal). Clear Windows. Black Interior. Chrome Real Rider 5-Spoke (RR5SP) Wheels. Chrome Base (plastic). Made in Malaysia. Toy# DHT83. Released in 2016 as #4 of 10 in the Muscle Mania Series (Super Treasure Hunt variation). RELEASE DETAILS: Metalflake Light Green Body (metal). Clear Windows. Black Interior. Chrome PR5 Wheels. Chrome Base (plastic). Made in Malaysia. Toy# DHR35. Released in 2016 as #4 of 10 in the Muscle Mania Series. Thanks Buddy…Nice Job !…Don’t forget the 100 % ers’ too.